Gourmet Girl Cooks: My First Meal Back at Home & the "Ms. Jennifer"
This evening I prepared my first meal since returning from Cordova, Alaska last night. I spent a good part of the day as a zombie and the rest unpacking, doing laundry and trying to reassure Spike that every time I walked out of the room I wasn't going to disappear for another week. LOL I kept our dinner super simple tonight because I knew I didn't need to be handling anything hot or sharp with my bumbled brain. 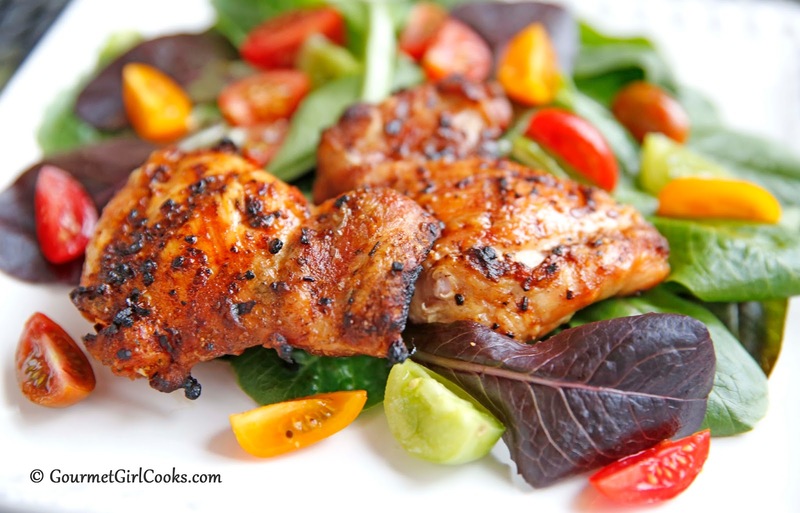 I had hubby grill some Chipotle seasoned chicken thighs and I served that alongside a salad of baby romaine and baby tomatoes (a/k/a Jet Lagged Chicken). It was quick, simple and good. This evening I realized that a number of you (my blog followers) don't have Facebook, too, which means that you didn't see the few posts and updates I made on it during the past week I spent in Alaska. 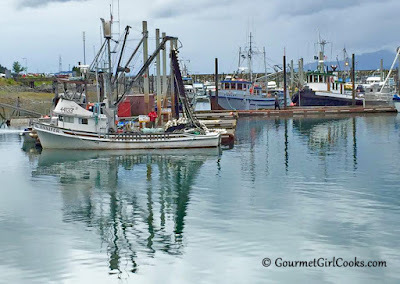 So, I will share one of my favorite photos of a boat named "Ms. Jennifer" which was my daughter's favorite boat (since it's named after her...LOL). She was my traveling companion on this trip. I won't go into a lot of detail about my trip because it deserves a better rested brain than the jet lagged version I have at the moment but it suffices to say that the people of Cordova were amazing and deserving of a post dedicated just to them. During my visit to Cordova I had the privilege to be among other very talented bloggers; Gina (of Running To the Kitchen); Michelle and her beautiful baby, Cullen (of The Runner's Plate) and Savannah (of Primal Revolutions). I still have at least 1,000 photos to go through but am looking forward to sharing this once in a lifetime experience with all of you. 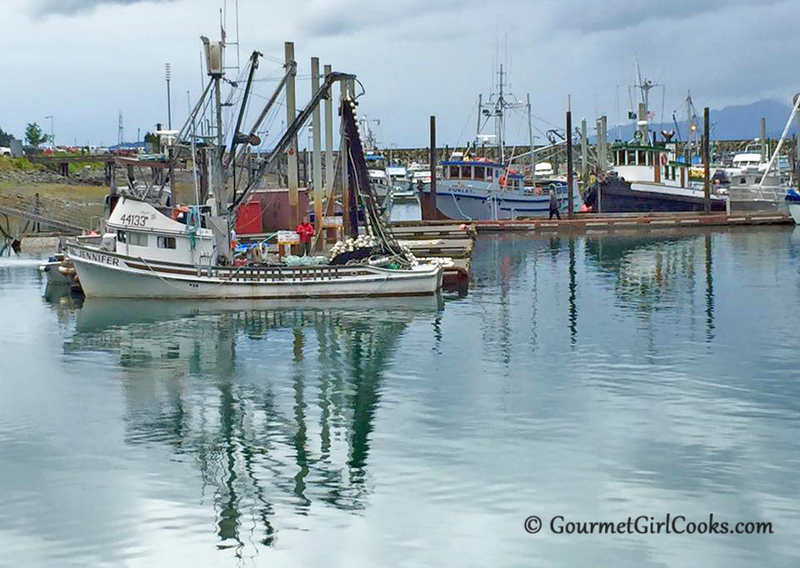 I have loved Copper River Salmon for years already...but it holds a very special place in my heart after visiting Cordova. I snapped a quick photo of tonight's simple meal and included a photo of "Ms. Jennifer" snapped with my iPhone. Enjoy! I am very glad you are back from your wonderful vacation with lots of pictures. And glad that I realized that you are on FaceBook too......I look forward to your blog everyday and just never thought to like you on FB.....Your blog is the only email that I eagerly open and read the moment I discover it in your inbox. Just wanted to say that and give you a big ole North Carolina THANK YOU! Hi Ayla, so glad that you had a little break, I never get used to the short vacations that Americans take, but I think this was something different, arranged for bloggers, n'est ce pas? You know that my brother in Germany gets 7 weeks of vacation! I feel bad for our citizens here ! Last night I had my grandchildren for dinner and I wish you could have seen how they loved your recipes, it was priceless as they gobbled down the food and had no time to talk! (That almost never is the case ) I served the cauliflower mash with the chicken enchilada sauce, to which I added more green chiles . I had no time to prepare the tortillas, which in a way was a good thing because everybody loved this combination . I added some colorful vegies .The cauliflower mash is always at hand, everybody is crazy about it. Since I cook it so often I shortened the cooking and prep time. I always worry about destroying the vitamins and minerals, so I cook half a head of cauliflower in 3 Tbs of water and microwave it for 5.5 minutes .I process it with 3 tsp. of chicken bouillon (organic Better Than Bouillon), the cream cheese and butter . It is very fast and very delicious and I have never left overs! I also used the sauce too make a delicious green chili bisque . So we really love your food creations Ayla. Thank you! lol. I am so mad! I can not write it again ! It has to wait ! You'll be happy to know that I actually received your longer post! Somehow it came through 3 times? Must have been some type of glitch in the system or something. I'm so happy to hear your grandchildren love my food/recipes! How great is that they will eat healthy foods like that? I'm impressed! Not sure I could have gotten my now grown children to have eaten cauliflower when they were younger.